This is your resource to get healthy. Whether you need help with getting insurance, finding a doctor or clinic, or tips on how to improve your overall lifestyle, we’re here to help. We see health in a holistic way and believe that health is composed of four things: physical, social, and mental health as well as economic stability. We are proud to partner with area agencies and groups to provide resources to ensure these qualities. Find a Clinic with our map of low-cost or free healthcare in your area. 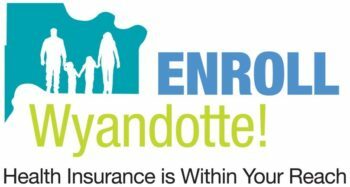 Enroll Wyandotte is your tool to answer questions and find health insurance. Take Charge of your health through health insurance and getting a primary care provider. Get Active by taking small steps to make big changes in your life. Reach out to our staff of community health workers to answer any other questions or concerns you might have. If you need extra help answering questions, making doctor’s appointments, or understanding the system, we are here for you. Click here to meet the community health workers in Wyandotte County.